Texas to the Bone™! We put the sizzle in our char-grilled steaks, serving the finest Certified Angus Beef® with legendary Texas hospitality. The menu recaptures the flavor of the open campfire, recalling the era when millions of longhorn cattle were driven south each winter to graze on the Texas Gulf Coast's salt grasses. The trail was known for the best beef in Texas. 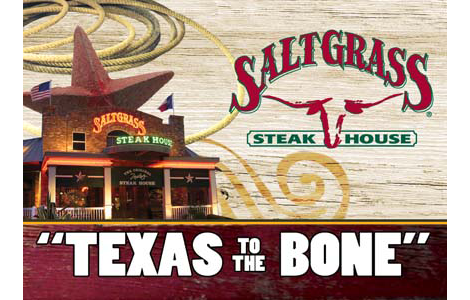 Trail riders headed to the Houston Livestock Show and Rodeo still bring their horses down it — and along the way, they still pass the original Saltgrass Steak House.